You can find Hunter here and more about her books here and here. For larger projects like the books, I like to work within a theme. It's easier to have a dinner party if you have a theme, and I'm convinced the same holds true for a knitting collection. For those, I find myself drawn to historical subjects. Oh, I more or less like it all! I'm not quite sure if it counts as a technique exactly, but I find I really prefer working in the round. For me, it's faster, more even, and easier to manage while I'm working. I have really big feet (my mother would say I 'have a firm foundation'). I know first hand how frustrating it is to fall in love with a project and see that it won't fit your needs. So I try to include several sizes for all my socks (and for most of my other projects too). 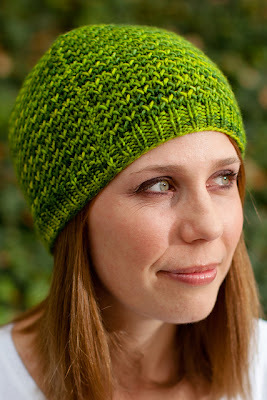 At the same time, I think you can do a lot of fine tuning by adjusting your gauge and yarn choice too. This works especially well for something like a hat or a mitt where sizing by adding an extra pattern repeat doesn't always work out. To help people feel confident doing these sorts of adjustments, I've started including information about sizing at a variety of gauges in some of my patterns. 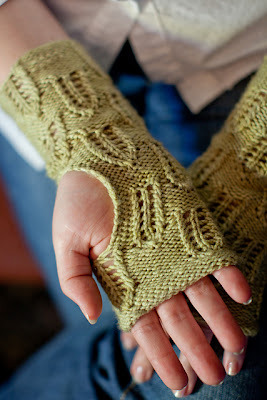 I think it helps knitters make informed decisions about their projects, and the response has been very positive. I’ve noticed that you work mainly on accessories and specialize in sock designs, could you tell us a little more about your design focus? I'm kind of a lazy knitter. The idea of making sweaters or shawls or anything else of that size just makes me feel a bit weak in the knees. 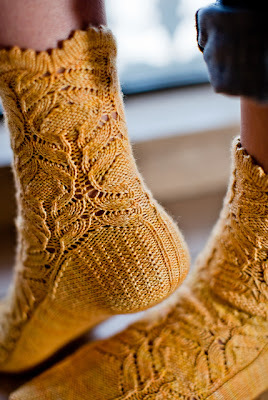 I think that socks and accessories are a much smaller time commitment, but still let the knitter play around with just about any technique imaginable. It's a better fit for my attention span! I mostly avoid it. It's too easy to have something sneak into the back of your mind and pop out later. Though I must confess I do glance at the new issues of a few favorite online magazines when they come out. I think every pattern is a balancing act between clarity and brevity. I also think that it is flat out impossible to strike the perfect balance for every knitter in a single pattern...someone will always want something different. With that in mind, I tend to err on the side of assuming knitters are clever folks. It's my job to be clear enough (and encouraging enough) to give them the confidence they need to tackle the project at hand. That doesn't mean extensive hand holding, but it does mean being careful to be as explicit as possible. I usually have each pattern tested by at least 3 or 4 people, sometimes more if there are lots of sizes or if the project is complicated. I've got a dozen or so folks who help me with sample knitting for books, though I make my own samples for individual patterns. Not at all. I stumbled into this by accident, and no one was more surprised than me when it turned into a job! There are lots of folks I admire, and a few I go to with questions, but no one who I'd call a mentor in a formal sense. Not really. So far I'm working on the assumption that if I put out a product I'm really excited about, that others will like it too. It's worked so far! I wouldn't even knit, much less design without the Internet! Yes, and she's a genius and worth her weight in gold. I'm not sure I do. Then again, I'm not sure anyone who is doing something they're passionate about really does. It's the trade off for a job you love, and I think it's worth it. Fairly well I think. If there's actually something that needs to be changed or corrected (a typo in a pattern for instance), I'm glad to know about it and happy to make the change. And if it's criticism that I have no intention of acting on (someone who doesn't like the name of a pattern for instance), I just laugh it off. I've only been designing for a little over two years. The first year, I broke even. The second year, I made a profit. This year, I am actually making enough money that I need to do things like talk to an accountant and a lawyer. But it's not really at the point where it would pay all of my household's expenses...give me a few more years! The organizational and administrative parts are every bit as important as the creative parts. Find a way to make them manageable for you, even if they don't come naturally. Mastering them will help you have this be a career, not just a dalliance. Wonderful interview. I loved her opinion on shawls and sweaters! it's the exact opposite of mine, but without people like her all our socks would be boring!! Do You Ever Knit the Same Pattern Twice?